Gold bulls are desperately defending the important $1,280 level. This test will largely determine gold's next short-term directional move. Gold/silver ratio favors silver ownership in the next precious metals rally. After enjoying top status as the premier safe-haven asset of choice for much of the last six months, gold finds itself at an important juncture. While its intermediate-term (3-9 month) rising trend is still secure, it’s also fighting to stay above a price level that many analysts and investors consider crucial for maintaining its near-term strength. Fading worries over the global economic outlook in recent days haven’t helped, nor has a rally in the U.S. dollar. With so many obstacles facing bullion in April, investors wonder how much life its six-month recovery has left. In this report, I’ll make the case that the flight-to-safety factor hasn’t diminished yet and will ultimately come to gold’s aid. We’ll also examine the attractiveness of silver as I explain how the white metal could resume a leadership position to gold in the next precious metals rally. Gold continues to hang on by a threat above its nearest benchmark support level at $1,280. 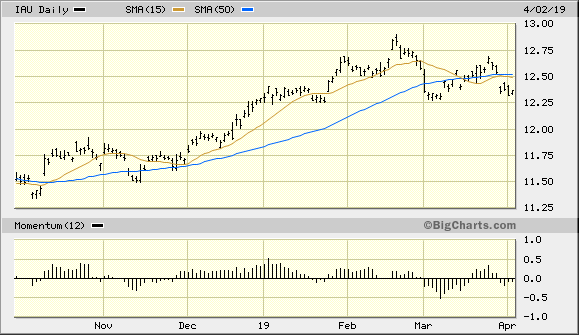 To their credit, the bulls are trying to rally the metal and get it back above its 15-day moving average. However, the metal is hovering above a 4-week low in the first week of April and faces near-term headwinds from a strong dollar and rising equity prices. As global equities are just below a 6-month high, gold is struggling to stay above the 120-day moving average (below) which has historically served as a marker for its prevailing trend. As previously mentioned, a weekly close for gold below its 120-day MA (not far from the pivotal $1,280 level) would send a decidedly negative message for the metal. It would likely rejuvenate the bears and encourage additional selling of the metal, especially if accompanied by a rally in the U.S. dollar index (DXY). Speaking of DXY, the dollar is hovering below a 3-week high and is also very close to its 52-week high. This is bringing pressure to bear on gold’s currency component and is making it very difficult for gold to rally, especially in view of the recent trade-related optimism. On that score, investors are anxiously awaiting the resumption of trade negotiations between the U.S. and China scheduled for this week. A conciliatory tone out of Washington during the trade discussions would likely buoy equity prices further, which in turn would undermine gold’s safe-haven demand. Already gold’s attraction as a safety asset is showing signs of fading in recent days, as holdings of the SPDR Gold Trust (GLD) fell 1.5% on April 1. This represented the largest 1-day holdings decline of the past month. The fact that DXY is above its 50-day moving average, which is now trending higher for the first time since last year, has provided gold investors with something else to worry about. Gold’s strength can, however, be restored as long as the dollar index doesn’t exceed its previous high from early March. But for now, the resurgent greenback has put the gold bulls on the back foot. 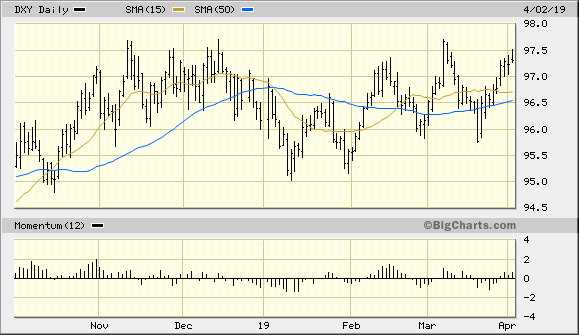 Of significance to the near-term outlook, gold’s relative strength versus the S&P 500 Index (SPX) is ebbing. Shown below is a ratio chart comparing the gold price with the SPX. Fund managers typically commit money to gold when the metal is outperforming equities on a relative basis. 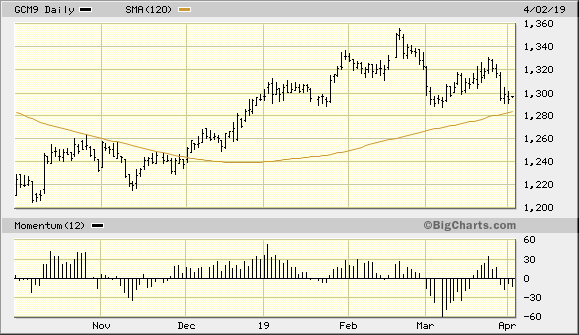 But as you can see here, gold is gradually losing strength when compared to the S&P. This isn’t exactly a ringing endorsement for institutional investors to buy the metal right now. We need to see an improvement in gold’s relative strength versus the SPX to let us know that strength has returned to the metal. For now, the gold bears enjoy a slight advantage as they control the immediate-term (1-4 week) trend. Meanwhile, the gold/silver ratio is currently above the long-term average after hitting 86.00 on April 2. Whenever this ratio exceeds 85.00, it tends to attract attention to silver as an investment opportunity since it implies that silver is significantly underpriced relative to gold. Gold and silver rarely move independently of each other, however, so we can’t expect a silver rally based on this factor alone. But once gold confirms its next immediate-term bottom and the precious metals commence a renewed rally, don’t be surprised if silver begins to outperform the yellow metal. Turning our attention to the gold ETF, the iShares Gold Trust (IAU) is still fighting to maintain its immediate-term bullish position after confirming an immediate-term (1-4 week) bottom on Mar. 20 (based on the rules of my technical trading system). I’ve recommended in recent reports that participants who purchased IAU for short-term trading purposes use a level slightly under $12.30 as the initial stop loss for this trade on an intraday basis. IAU is struggling to remain above $12.30 in recent days but has so far managed to avoid violating this key level. IAU desperately needs a quick reversal in order to prevent our being stopped out of this trading position. Traders should accordingly monitor IAU very closely in the coming days. What we’re now witnessing in the way of Wall Street’s optimism on the global trade front being restored we’ve seen on more than occasion in recent months. Indeed, the alternation of extreme fear followed by a sense of (temporary) relief has been the recurring pattern for the better part of the last year. It’s highly doubtful that this pattern will reverse anytime soon. If the cycle holds true to form, we should see the next outbreak of fear among investors once the next earnings season gets into full swing later this month. For now, though, gold investors should expect more turbulence as long as the dollar remains strong and global equity markets are surging. On a strategic note, only if the dollar breaks out to a new 52-week high and continues to rise on a sustained basis would I be forced to reevaluate my bullish intermediate-term gold outlook. While I don’t recommend initiating new long positions in gold or the gold ETFs right now, investors are justified in maintaining intermediate-term long positions in gold based on the prevailing fundamental and psychological factors discussed in this report. Disclosure: I am/we are long IAU. I wrote this article myself, and it expresses my own opinions. I am not receiving compensation for it (other than from Seeking Alpha). I have no business relationship with any company whose stock is mentioned in this article.